Hse Consultant - Service Provider of softwares dovelopment service, fire protection system design service & basic engineering consultancy service in Vadodara, Gujarat. Fire Protection System is designed as per fire protection manual (FPM). Fire Protection System shall meet requirements of Tariff Advisory Committee (TAC). All pipelines indicating peraeters, gradiants, insulation details etc. "How would we know it?" "What could we do about it?" At HSE Consultant HAZOP Study Is Carried Out With Reliable Software under the guidance of experienced & efficient technocrat. HAZOP is one of the most powerful, imaginative techniques to eliminate the probable hazards that may arise during the operation of the plants/industries. This analysis method makes plant operations intrinsically safe. This method was first developed in Great Britain at ICI in 1964 and has been refined several times since. The HAZOP technique is very versatile, and can be applied to both continuous and batch processing. The HAZOP process is based on the principle that a team approach to hazard analysis. Typically, QRA techniques are used to obtain a better understanding of the risk posed to people who live or work near hazardous facilities, and to aid them in preparing effective emergency response plans. When conducting a QRA, consequence models are used to predict the size, shape and orientation of hazard that could be created by releases of hazardous materials. The hazards of most interest during the QRA of a petroleum or petrochemical facility are toxic vapor clouds, fire radiation, and blast waves. Identifying and defining possible hazardous events and their potential outcomes. Estimating the annual probability of occurrence of each potential outcome of each hazardous event. Combining the probabilities and consequences to arrive at estimates of individual and societal risks. The main objective of the Quantitative Risk Analysis (QRA) study is to determine the risk of major hazards having damage potential to life & property and provides a scientific basis to assess safety level of the facility. Potential hazards from the existing facilities are associated with accidental releases of toxic/flammable gas, toxic/flammable liquefied gas, and flammable and combustible liquids. Hazardous events associated with gas releases includes gas clouds, flash fire and vapor cloud explosions. Hazardous events associated with potential releases of toxic/flammable-liquefied gases include toxic clouds, flash fire, jet fire, BLEVE, Pool Fire and vapor cloud explosions. Releases of flammable or combustible liquids may result in pool fire. Safety audit ensures the safe guard of life and property. Safety audit ensures minimizing the possibilities of incurring liabilities like public liability etc. due to hazard in the plant and process. Statutory Compliance Records Checking and Confirmation. The gains to the developing country host parties are in the form of finance, technology, and sustainable development benefits. The CDM enables the Parties to meet their reduction commitments in a flexible and cost-effective manner. It allows public or private sector entities in Annex I countries to invest in GHG mitigation projects in developing countries. In return the investing parties receive credits or certified emission reductions (CERs) which they can use to meet their targets under the Kyoto Protocol. Typically an energy audit is conducted to seek opportunities to reduce the amount of energy input into the system without negatively affecting the output. The energy audit effectively saves the energy consumption & increases the profitability. In the larger interest of the universe it reduces the production of green house gases there by reducing the global warming. This is result oriented program developed to suit the clients requirement to enhance the safety of the organization in an effective manner. HSE Consultant develops Innovative & Creative & Pictorial MSDS. MSDS is the surest & the simplest means to understand the hazardous property of the chemicals & safe way to handle the chemical. MSDS is available in English, Hindi and other languages. Being carbon neutral means to be the caring organization for the next generation. Being carbon neutral, or having a net zero carbon footprint, refers to achieving net zero carbon emissions by balancing a measured amount of carbon released with an equivalent amount sequestered or offset. Business Operations: The emissions generated from the operational activities of the company have been calculated (Operational Footprint). Includes any third party inputs from those company that help with the total operations of the business (i.e 3rd party transportation of goods). Visualizes safety in your time space of your work. 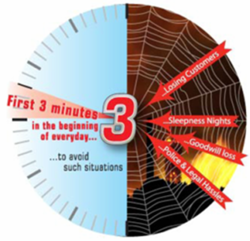 Reaches to the every corner of your organization with in the blink of a moment to enhance the safety awareness of all.